Last updated 11 December 2015 . By Conor Fox. 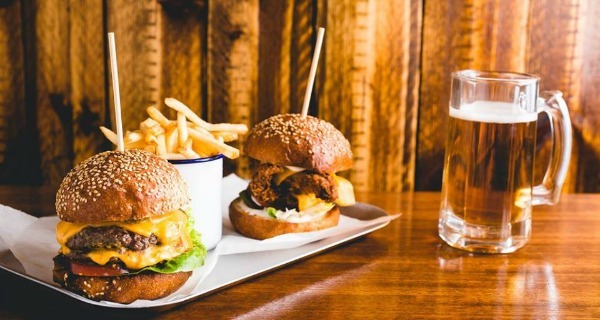 Bourbon, burgers and Brummies – oh my. I got familiar with one of the most talked about new burger openings in the city. Buffalo & Rye is the latest offering from Bitters N Twisted, the team behind the Victoria and the Jekyll and Hyde. 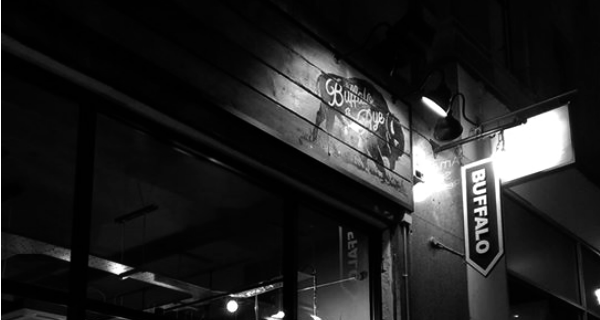 Off New Street and just beside its South American sister Bodega, Buffalo & Rye takes inspiration from Americana; however think less flashing neon diner and more down low. With its rustic woodwork and dim lighting, we were treated to more Americana than 50s bright benches, and that stands in good dinner stead. Humble and hearty, Buffalo is a great step away from gaudy American dining. Faced with a plethora of smoked meats, gourmet dogs, and self-styled ‘dirty’ burgers, we opted for two burgers, a Cajun fries and chicken wings to share. Being a Plain Jane kinda guy, I went for the Buttermilk Chicken (£8.25) which was anything but plain. Perfectly breaded and suitably seasoned, the chicken held its own amidst the assortment of red meats. A House Cheese Burger (£7.50) also landed on our table and was declared above-average – high praise for a cheese burger? Our server advised us to go for eight chicken wings; however, at £13 for eight they didn’t come cheap. While the food did impress, the main attraction of Buffalo & Rye is the expansive drinks menu. Although I’m not known as a bourbon boy, it would have been rude not to sample the whiskey selection. A Sazerac (£8.50) started me off, straight up Wild Turkey Rye served with bitters and sugar, and while I gradually adjusted to the sharpness, I did move on to an Apricot Smash (£7.00). Jim Beam bourbon with lemon juice, mint and apricot jam (I’m still not quite sure where the smash came into it), this one hit the spot. The big sellers seemed to be their adult milkshakes, strictly not for kids. The burgers are complimented by an almighty drinks selection. Buffalo and Rye offers a relaxed vibe with long benches for groups or single tables for those dining in pairs. Normally I detest when food isn’t served on a plate – chopping boards can chop right off – but the metal trays here somehow worked. They added to the old school feel without seeming too try hard. Condiments were delivered in beer six packs, an odd choice as there were just three options to choose from, yet six spaces – aren’t sauces a pretty big part of a burger and hot dog bar? Placing aside my pedantic focus on ketchups, the wait staff and managers clearly know their stuff and are more than happy to recommend drinks. If you’re a whiskey virgin, I’d suggest letting them in on that secret and placing your faith in their hands. 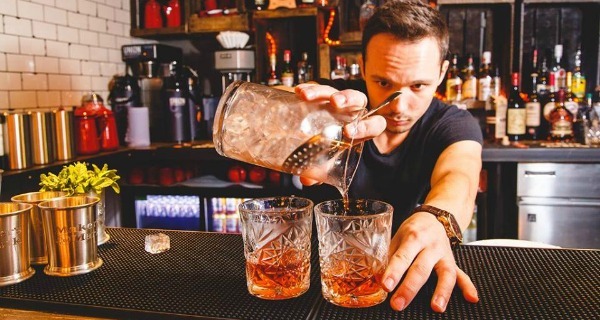 Bartenders whip up a lean and mean selection of cocktails at Buffalo & Rye. A chilled alternative to Birmingham’s copious burger bars; come for the meats and stay for the mixes. Buffalo & Rye won’t disappoint: good food and great drinks done well. Irish guy accidentally in Birmingham; drinking my way through the situation.